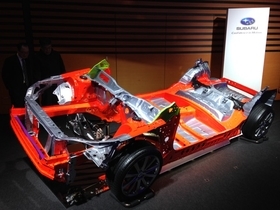 The Subaru Global Platform is designed to accommodate gasoline drivetrains in addition to traditional hybrid, plug-in hybrid and all-electric systems. TOKYO -- Subaru has unveiled a next-generation vehicle platform it says will improve safety and driving performance while keeping the small Japanese automaker competitive through 2025. The new architecture will underpin all the brand’s nameplates beginning with the redesigned Impreza small car arriving in the second half of this year. The Subaru Global Platform is designed to accommodate gasoline drivetrains in addition to traditional hybrid, plug-in hybrid and all-electric systems. Details of the new technology were outlined on Monday by executives at the global headquarters of Fuji Heavy Industries, Subaru’s parent company. The platform is a key pillar of Fuji Heavy’s plan to achieve worldwide sales of 1.1 million vehicles in the fiscal year ending March 31, 2021. “Starting with the car coming out this year, we will advance the next level, using the new Subaru Global Platform to provide Subaru with more safety and fun every year,” said Naoto Muto, executive vice president for global engineering. The new platform should be able to underpin Subaru vehicles through 2025 with regular improvements, executives said. Subaru also outlined new targets for autonomous driving, using the brand’s camera-based Eyesight safety system. Next year, Subaru will introduce a new traffic jam assist function. It will allow the car to start and stop automatically in slow traffic and steer the car automatically around curves. Subaru’s current system requires the driver to manually re-engage acceleration once the car has come to a full stop. The existing technology also does not feature automatic steering. Traffic jam assist will work at speeds up to 40 mph. Then by 2020, Subaru said it will introduce a semiautonomous driving function for highway driving. That system will allow automated lane changing and automated steering around curves. It will combine radar sensors and GPS mapping with Eyesight. The new platform will not only make Subaru cars safer and more fun to drive, it will make the cars less costly to engineer, said Tetsuo Onuki, vice president of global engineering. That is because it will be possible to produce components for multiple models at one factory, instead of over multiple factories. This will increase efficiency and allow Subaru to more flexibly shift production between factories in the United States and Japan to quickly adjust to changing demand. Subaru can focus its limited personnel and product development resources on variations of one platform, instead of spreading them thinly across multiple platforms. Finding new ways to boost efficiencies while improving its cars is key for Fuji Heavy in an era in which bigger rivals are increasingly able to leverage volume to slash costs. Subaru channeled savings into upgrading the performance of the new platform, Onuki said. The goal is to enhance the product without raising sticker prices, he said. For ride and handling, Subaru aimed to surpass European brands, he said. Subaru is the latest of several automakers to roll out commonized platforms. Toyota Motor Corp. just debuted its iteration, the Toyota New Global Architecture, in the redesigned fourth-generation Prius hybrid. Nissan Motor Co. launched its Common Module Family platform in 2013 in the Rogue crossover. Subaru will add production of the redesigned Impreza to its U.S. factory in Lafayette, Indiana, this year. That will boost annual production capacity there to 394,000 by the end of 2016 from 200,000 at the start of the year. Subaru already produces the Legacy sedan and Outback crossover in the U.S.
Subaru will also build a new three-row SUV at the plant starting in 2018. That vehicle, which will also be based on the new global platform, will replace the aging Tribeca. Also in 2018, Subaru plans to begin selling its first plug-in hybrid.